Anyone who was disappointed to learn that the Playwright was closing this past August barely had time to drown their sorrows before they got some good news – the cozy South Boston pub would be reopening a couple months later, with the same ownership but a new concept. Granted, a “new concept” can be a tough sell for long-time customers of a 17-year-old bar. But the Punk & Poet, which opened in September, is more of a reboot than a reinvention of the Playwright. The new entry is more polished than its predecessor, with improved seating and updated fixtures. But the biggest change is the deliberately edgy aesthetic. Living up to its new name, the walls of the Punk & Poet are lined with books, from Irish pub guides to classic works of literature. One corner is devoted to graffiti and punk rock references. Antique typewriters, cassette tapes, and other odds and ends punctuate the new shelves. It’s an approach that would seem contrived if the Punk & Poet didn’t feel like a natural outgrowth of the Playwright. Indeed, for all its hipster/man-cave vibe, it’s clear that the changes are intended to maintain a familiar feel for loyal customers while staying relevant in a changing neighborhood. And that extends to more than just the décor. In place of a sprawling menu of average pub fare, the Punk & Poet offers a streamlined, more contemporary menu. The focus is still on comfort food, but the selections are fresh and thoughtful. While it’s still a laid-back spot for throwing back a few beers, the Punk & Poet adds another dimension with its modern cocktail program. Playfully written out on a menu of cassette labels, the drinks are befitting of the bar’s evolution. They’re approachable and affordable, and they don’t look out of place in a bar that’s trying to maintain its down-to-earth vibe. 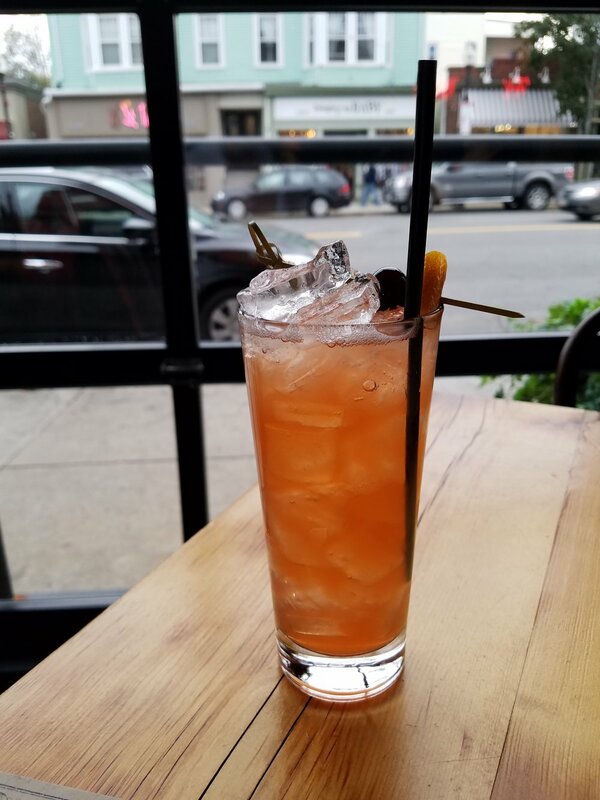 The Clash looks sweet and fruity, but it’s a balanced, lightly floral drink combining tequila, St. Germain, Aperol, simple syrup, lemon, and Angostura bitters. Playing off the classic Sazerac is the Sucker Punch, a mix of Rittenhouse rye whiskey, chocolate porter beer syrup, Peychaud’s bitters, anise rinse, and lemon oil. The Pink Poet, meanwhile, is simple but exquisite. Made with Gin Lane 1751’s pink gin, pink grapefruit, and Peychaud’s, it’s crisp, sour, and refreshing. In October, the Punk & Poet donated a portion of its proceeds for every Pink Poet sold to the Ellie Fund, which provides support services for breast cancer patients. Bright and sweet, the Rumjack combines Plantation dark rum, simple syrup, fresh mint, lime, angostura bitters, and sparkling wine. It’s a smooth cocktail that accentuates the notes of vanilla in the rum. Although it’s a little glossier and more choreographed than its predecessor, the Punk & Poet doesn’t stray far from the formula that made the Playwright a South Boston fixture for nearly two decades. 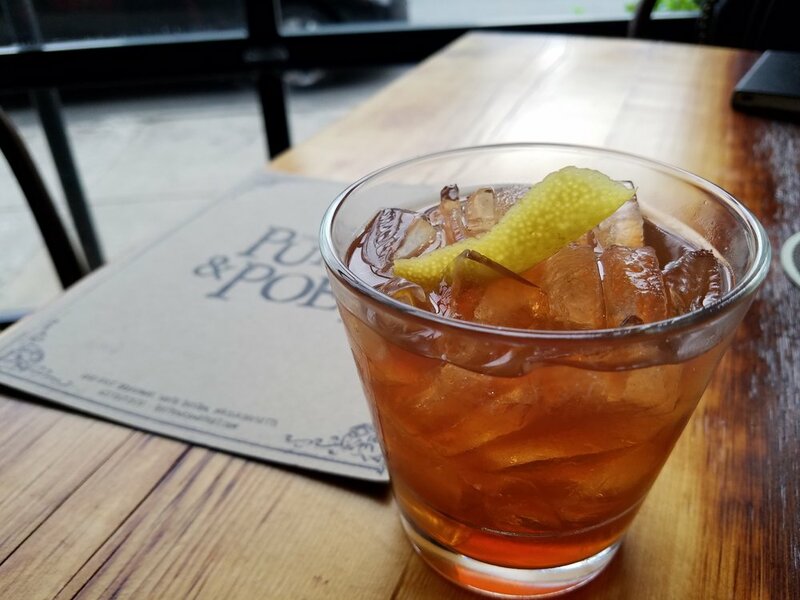 The new menu and beverage program may serve to broaden its appeal, but the Punk & Poet remains an unpretentious neighborhood pub. And that sort of thing never goes out of style.